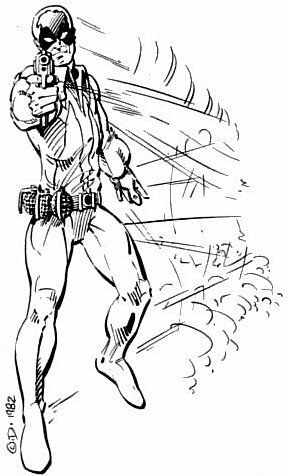 Powers/Abilities: As well as being a trained mercenary and proficient in numerous weapons, Mercury Mercenary is also incredibly fast. History: 'Merc', as he is called by close associates, does not know his own original identity. His memory goes back only as far as a bloody conflict in South America in the early 80's. It was during that conflict he was apparently struck by a bolt of lightning. Unsure of which side he was on, his clothing and identification were too badly damaged, he took the uniform of a nearby casualty, donned a makeshift mask, and almost single-handedly won the battle for the side his new uniform represented. Merc has made no attempt to remember who he really is, and in fact, avoids anything which might possibly remind him. He prefers to be a man without any allegiances, leaving himself open to hire by whoever holds up the most money. This attitude has made quite a wealthy man. Comments: Created by Jack Herman and Jeff Dee. Art on this page by Jeff Dee and copyright to him.